Christmas was a low key affair and so we decided while we were in Brisbane we had to do something big. 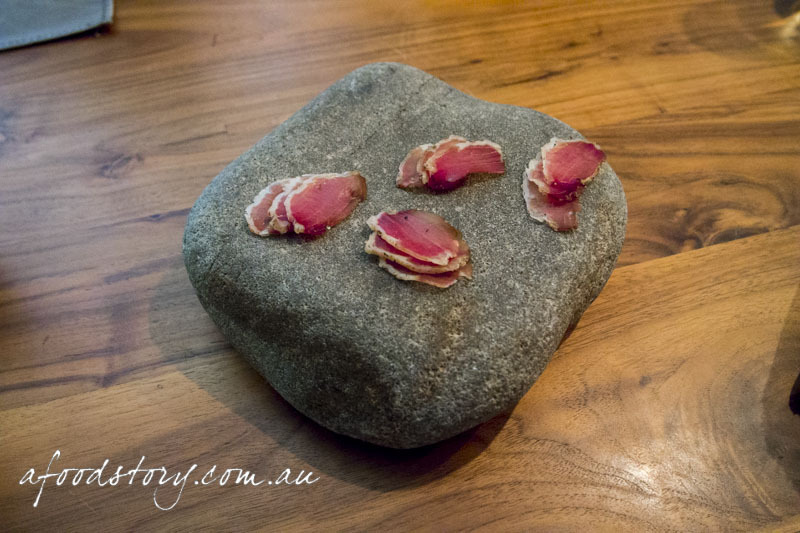 We decided to tick off the only other three hatted restaurant in Australia that we hadn’t been to (having previously ticked off all The SMH Good Food Guide and The Age Good Food Guide three hatted restaurants). Dylan’s brother Hayden and his wife Emma were keen to get amongst it, so we made our booking for Saturday night, our last night in Brisbane. 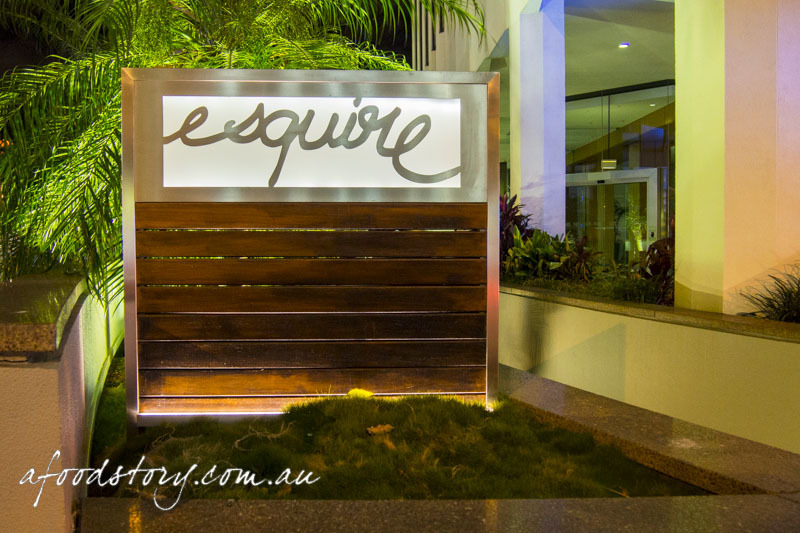 Esquire is owned by Executive Chef Ryan Squires and business partner Cameron Murchison. Since its opening in mid-2011 the restaurant has gone from strength to strength, which is really no surprise given Ryan’s CV includes the likes of French Laundry (California), Per Se (New York), wd~50 (New York), elBulli (Spain) and noma (Denmark). 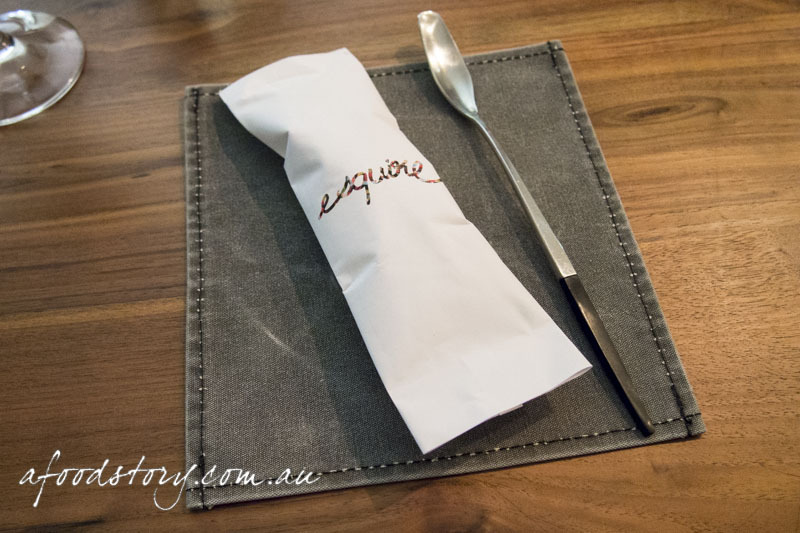 Esquire was awarded three hats in the inaugural brisbanetimes.com.au Good Food Guide 2012 and again in 2013. 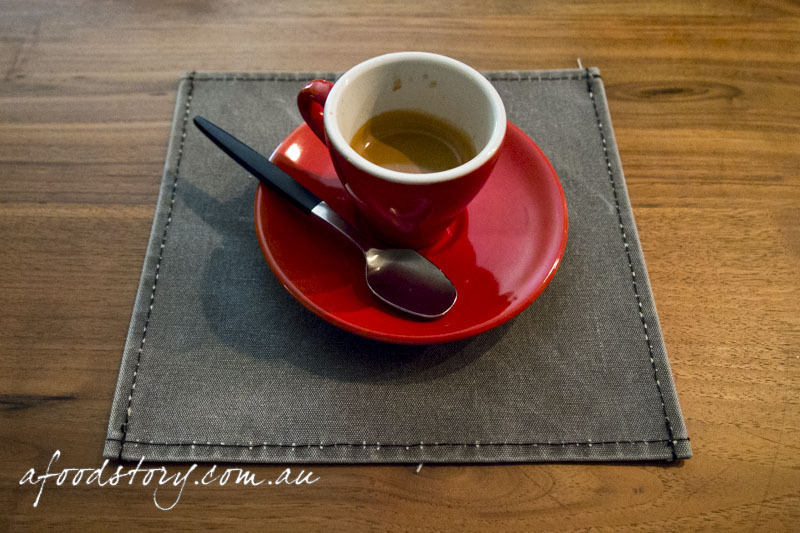 The restaurant also took out the ‘Vittoria Coffee Restaurant of the Year’ both years. Polished concrete flooring, walnut tables and chairs, black cabinetry, the fit out has a neutral colour palette. We’re led past two open kitchens and up three stairs to one section of the restaurant. The space feels smaller and more intimate than it is, sectioned off by large pillars and clever design. Oversized light fittings hang low from the ceiling. 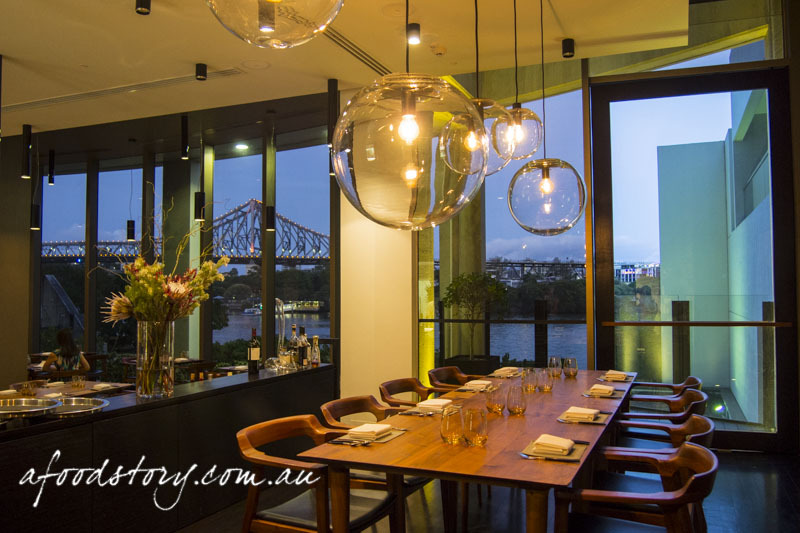 From our vantage point we can see much of the restaurant and have views out the floor to ceiling windows, overlooking the Story Bridge and Brisbane River. sorrel, sheep yoghurt & peanut. 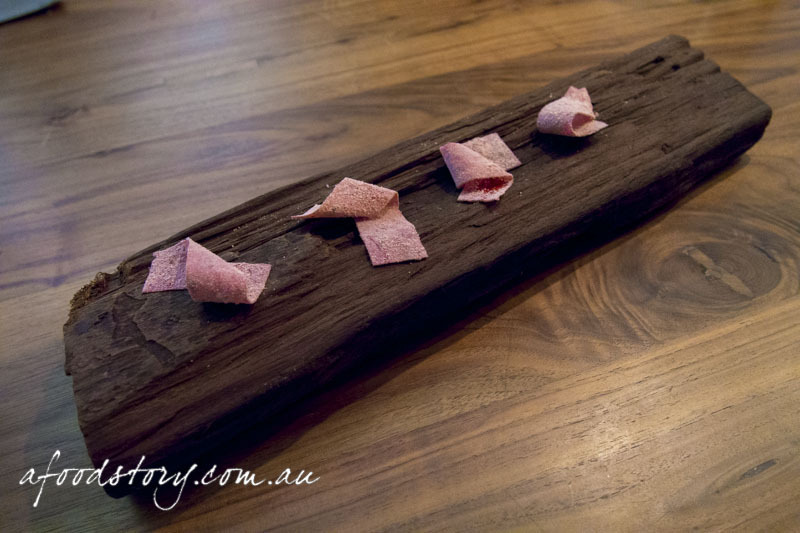 We were taken aback when an amuse bouche landed on the table before we’d even been taken through the menu or asked about dietary requirements. Particularly when it contained peanuts, a common allergen (yes the online booking form asks about dietary requirements but we hadn’t yet been asked in person). It didn’t sit quite right with us but as none of our group have any allergies we needn’t fret and dove in. Dark green sorrel granita was big in flavour, bitter and sweet. On its own it was bold and fresh, mixed with the ultra light sheep yoghurt it worked a treat. A smattering of peanuts on top added crunch. We’d expected two options with the menu, small and large, as we’d seen on the restaurant’s website. But only one menu was presented to us, presumably because of the time of year and the holiday season. Whatever the reason we didn’t mind, we would have opted for the large menu regardless. berries, pine nut & duck ham. 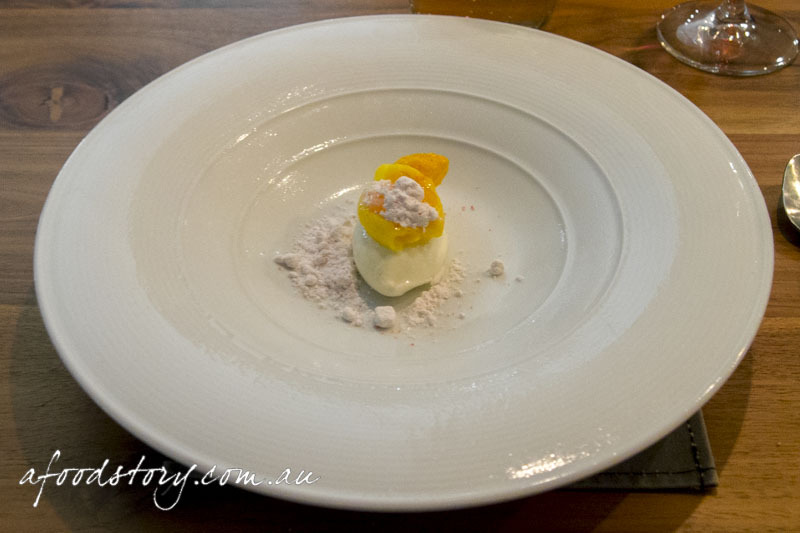 Having then been taken through the menu and dietaries discussed the degustation really got underway. 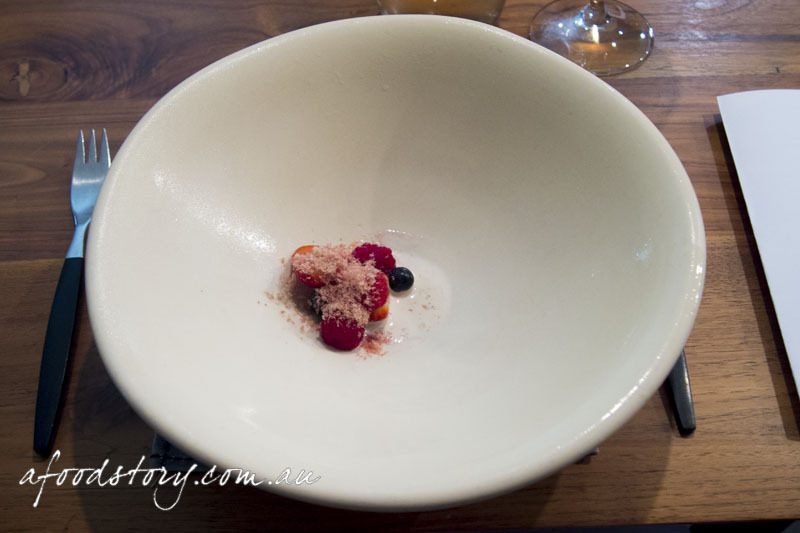 An extremely unusual combination of berries, pine nut and duck ham had us all guessing what format and structure the dish would have. None of us guessed the duck ham would be shaved over fresh summer raspberries, strawberries and blueberries which sat in a puddle of sweet pine nut milk. Unexpected? Yes. Exceptional? Yes. The meal was off to a good start. striped trumpeter, mustard & ginger. Next up was the first seafood dish of the evening. 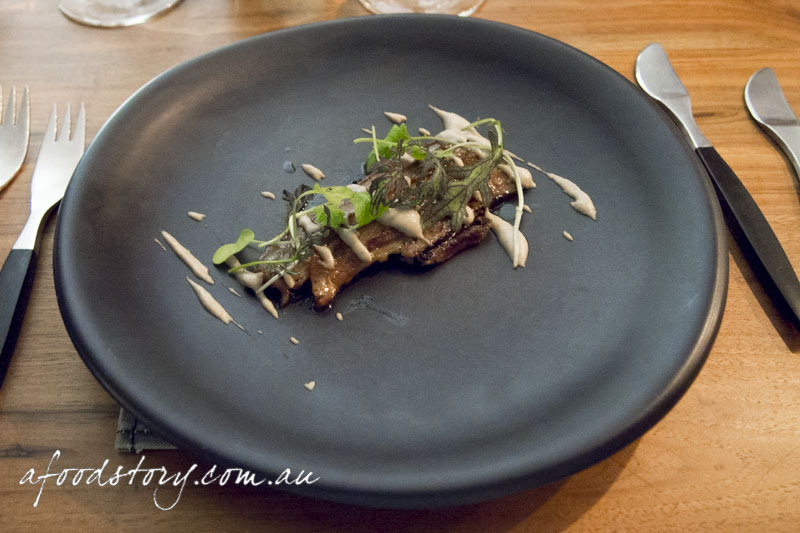 Presented on a large glossy white plate and taking up a very small section of it we had a pretty mix of striped trumpeter and mustard greens vinaigrette interspersed with pickled ginger nearby a shiitake mushroom powder. It was the shiitake mushroom powder which had us all talking, a umami hit to counter the bitter vinaigrette. blue swimmer crab & coffee. Following on from the trumpeter was another seafood dish but yet another combination to surprise and delight. 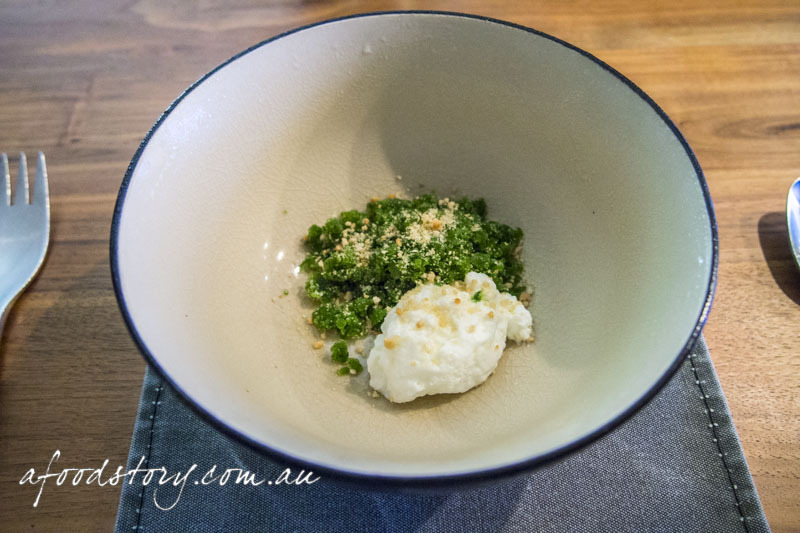 Blue swimmer crab from Redland Bay, the coffee component a crumb which the chefs used wisely to ensure the sweet crab meat would never be overwhelmed. Smoked nut milk sauce was what pulled the crab and coffee together in harmonious fashion. I’d been apprehensive before this dish but was quickly reminded to not judge a book by its cover (or a dish by its name as the case may be). beetroot, goat milk & carrot. Beetroot and goats milk/cream/curd are a classic flavour combination but we wondered how Esquire would turn it on its head. Unexpectedly this course was actually a little snack in ice block format. We hadn’t guessed the beetroot and carrot elements would have been in juice form, frozen to produce a lovely sweet ice block with a tart goat milk layer. Something familiar made for a fun interlude. Strawberry straps took us all back to our youth where our lunch boxes were filled with Uncle Toby’s Roll-Ups. But while we all have memories of the chewy snacks being artificially sweet and getting stuck in our teeth what Esquire presented was worlds apart. Delicate and supple, the straps were sour in that delightful way not that mouth-puckering face contorting way. Most of all they tasted of strawberries. The final snack before we continued on to the mains was a few small pieces of wild boar lomo. Lomo is Spanish for tenderloin and before us we had cured tenderloin of wild boar. Full of flavour the lomo was delectable but disappeared rather quickly. Senses heightened we were ready for mains. I was really excited about the lamb dish as I’d heard Esquire use Milly Hill lamb which has been exceptional every time I’ve tasted it. Here the dish was incredibly tender slow cooked Milly Hill lamb belly dressed up with red elk, baby cabbage, white garlic and almond sauce. Exquisite. 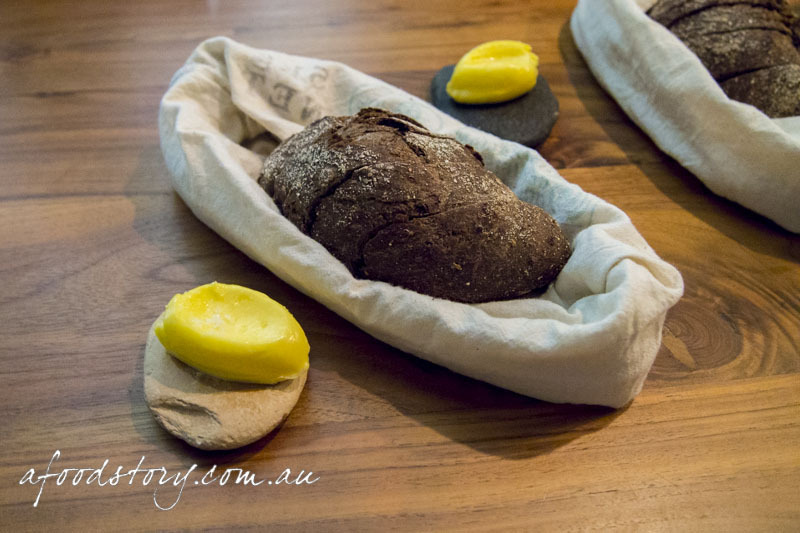 Not too unusual for fine dining restaurants these days bread was presented half way through the meal, giving diners the perfect chance to review how full they are and whether they have space for bread. House baked dark rye, it was still warm and the slab of butter I added melted nicely. corned wagyu beef, pickles & ketchup. It was the final main I was the most unsure about. Perusing the menu at the commencement of the evening I was pleased to see wagyu on the degustation but unsure about the corned beef form and accompaniments of pickles and ketchup. I thought this would be a very big miss for me. Having never had corned wagyu beef before I was interested to see what it would be like. Wagyu from Darling Downs brined for five days and slow cooked, it was the best corned beef I have ever eaten. Succulent and tender. 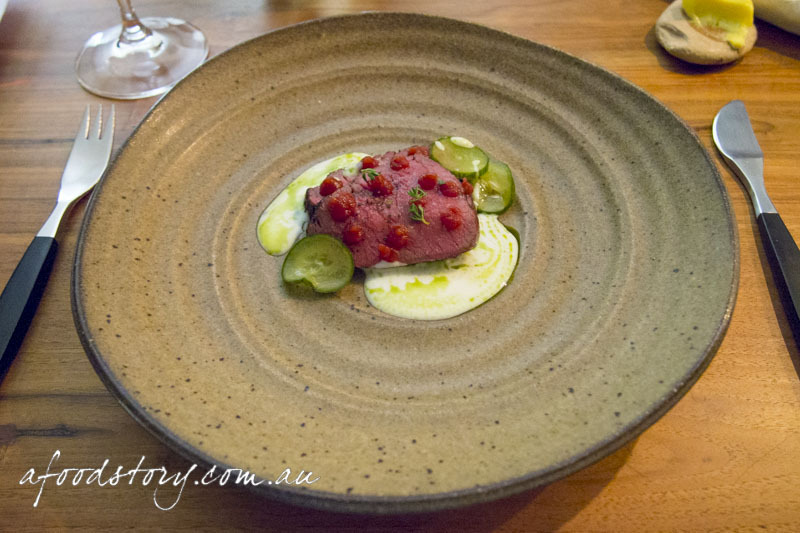 Dollops of ketchup were Lex-friendly in their lack of astringency and hints of star anise, pickled cucumbers did less to impress but the real surprise was the horseradish yoghurt which was excellent with the beef. It turned out to be a big hit. 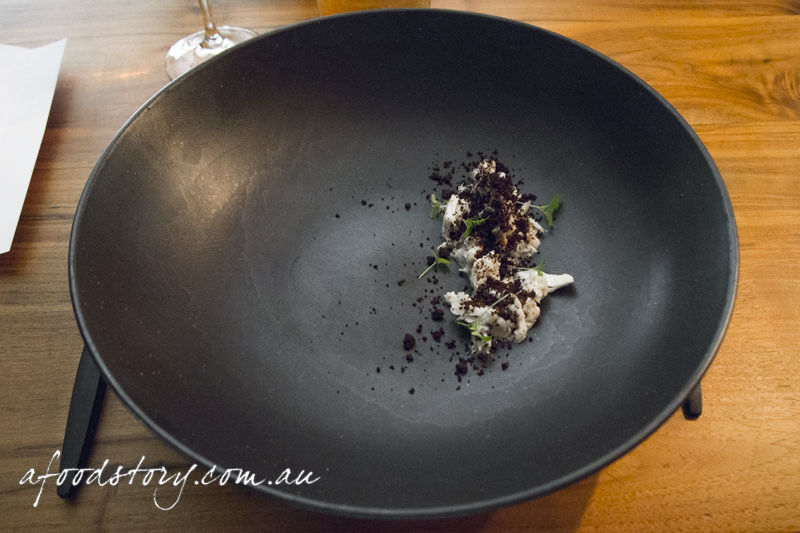 The next course was simply titled ‘popcorn’. Everyone around the table was guessing what it would really be. All we really knew for sure was that it wouldn’t be plain old popcorn. Presented with a traditional ice cream paper wrapper and a spoon we all looked at each other and smiled. Esquire pulls out all the stops for each and every course. 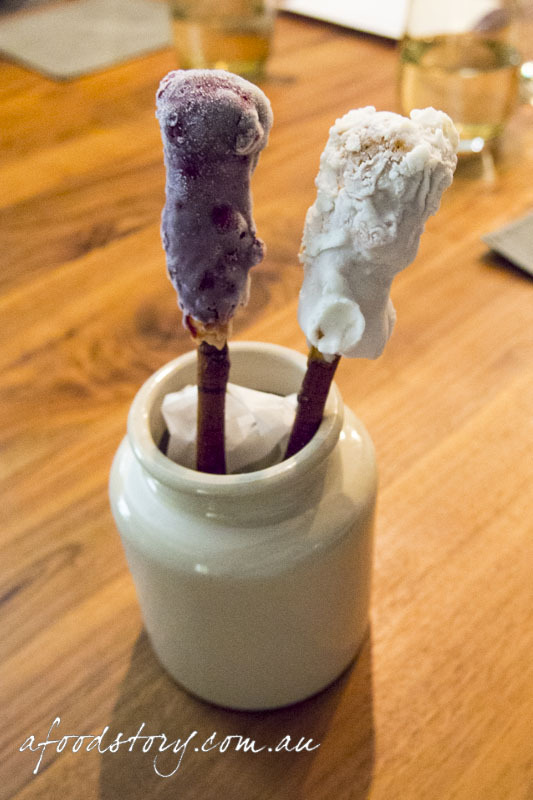 It could be try hard and it could be wanky but the theatrics at Esquire amplify the dishes and are small touches that really make a difference. 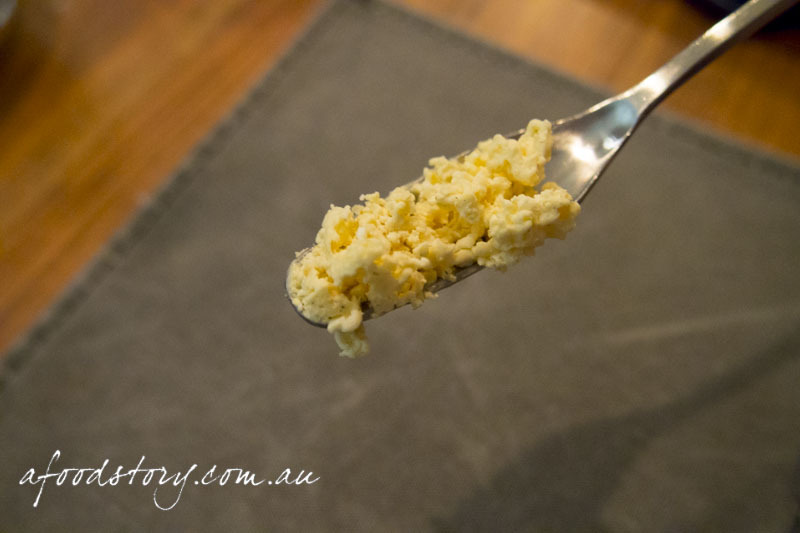 Digging into the parcel we discovered a popcorn parfait dusted in popcorn powder and with hints of tarragon oil and caramel. 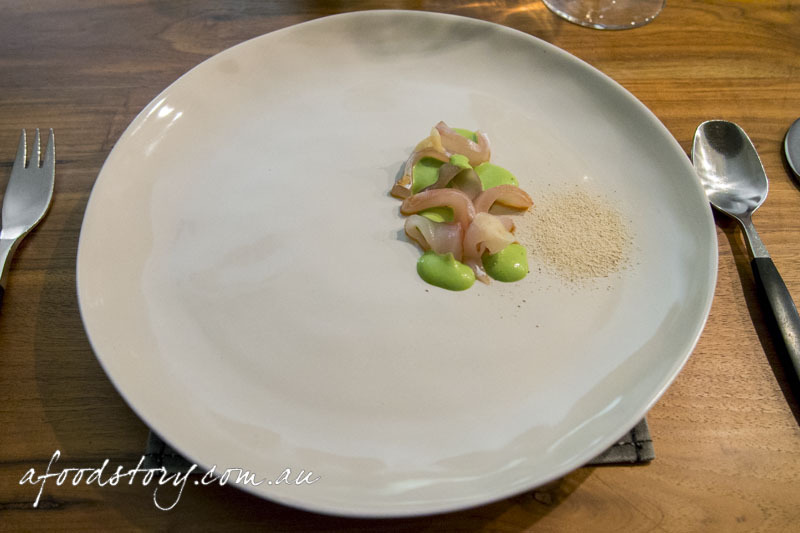 A course that played on the senses, it was cold when the familiar is hot, sweet on the nose but somewhat savoury in the mouth. white asparagus, vanilla & citrus. Moving onto the first plated dessert this was another dish to keep you on your toes. 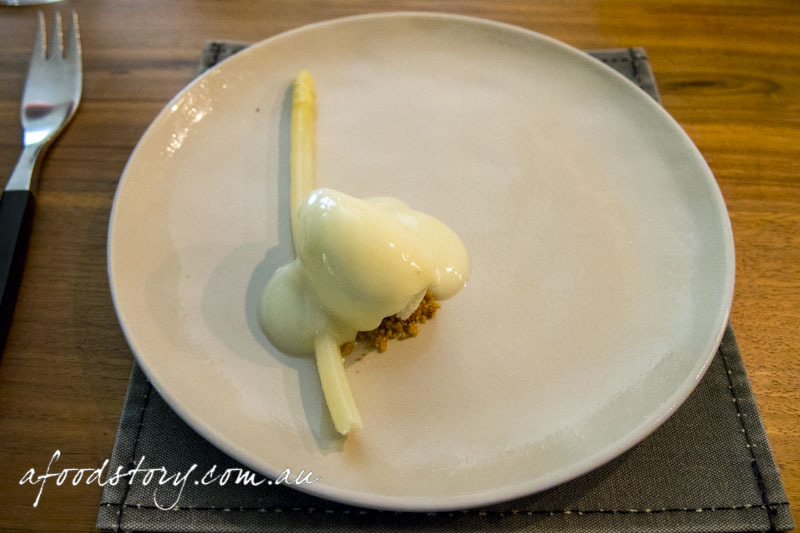 A beautiful white asparagus lay the length of the plate with a scoop of ice cream, light malt biscuit, vanilla and citrus sauce. Was it sweet or savoury? It swung between the two. The jury was out on this one. 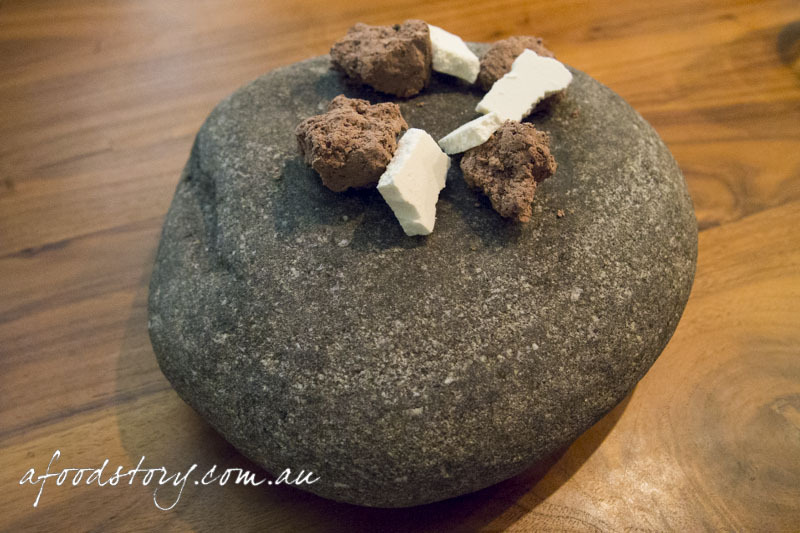 Presented on a rock were a number of chocolate rocks for us to enjoy. Chocolate and coconut were familiar and tasty but lulled us into a false sense of security before trying the white rocks. Less familiar was the addition of horseradish to the white chocolate which was a nice little touch. Plated dessert number two was absolutely stunning. 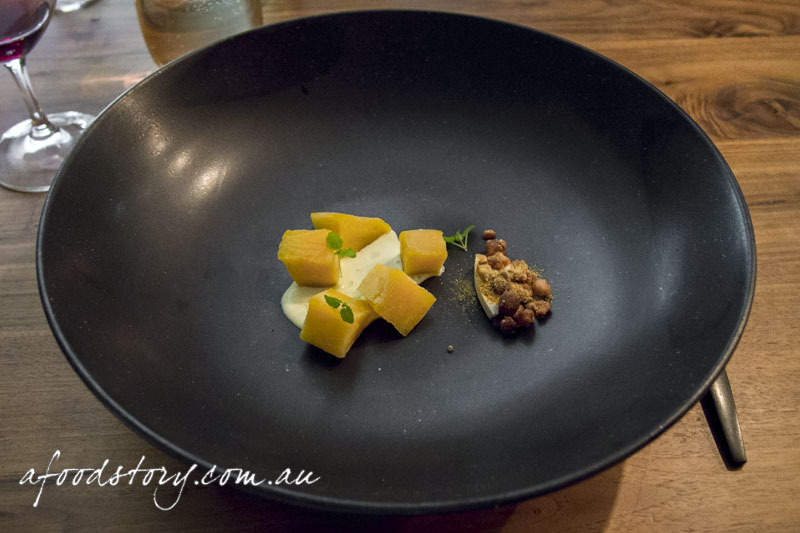 Kensington pride mangoes were the star feature – frozen and compressed mango pieces – with honey, earl grey tea, lavender cream, macadamia cream and mango ash. Yes there was a lot going on but each addition took the dessert to greater heights and made for a truly outstanding dessert. campari, orange, curds & whey. The last dessert just happens to be the only dish that has remained on the menu since opening (in various forms). A quenelle of curds and whey ice cream, orange sorbet, freeze dried orange topped with mandarin jelly and Campari sherbet and crystals. One of the best uses of Campari I have ever experienced and a dessert that should forever remain on the menu. 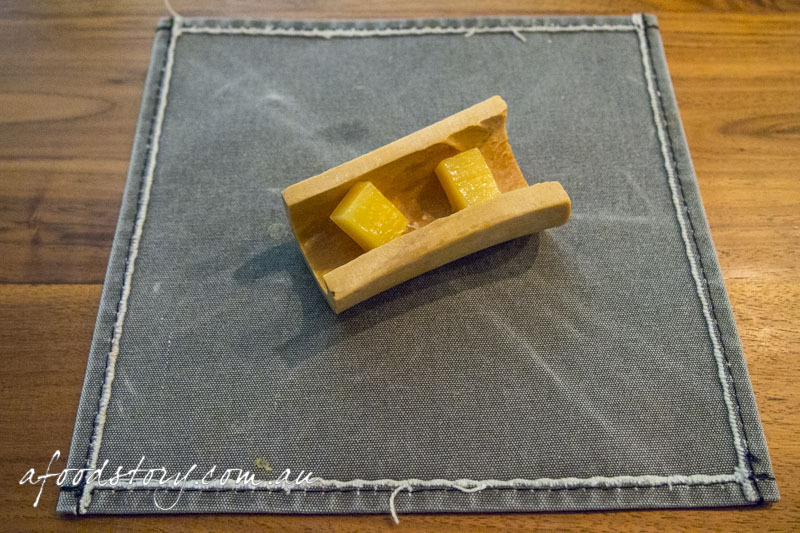 Two innocent little squares were presented as the petits fours. But these were no ordinary petits fours. For a start they’re presented in a hallowed out bone. They’re wagyu fat caramels. At first they tasted like any other caramel and then an underlying beefiness entered. Dylan and I fell instantly in love, these were the best caramels ever. All caramels should be wagyu fat caramels. And of course the night finished with a nice little espresso to aid digestion. How did Esquire stack up against Sydney and Melbourne’s three hatters? Food wise, it was on par if not ahead of some of them. Location wise, it was on the river but I’m not sure the view quite compares with that of Sydney harbour or 55 floors up the Rialto. But the main thing I didn’t feel was quite on par with Sydney and Melbourne’s finest restaurants was the service. It felt a little too relaxed and didn’t quite match the fine dining experience. All in all I’m splitting hairs here, we had a wonderful meal and would love to head back to Brisbane to do it all again soon. Really nice and helpful review – thanks!